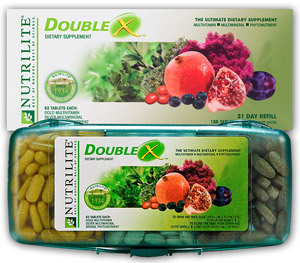 The Double X supplement by Nutrilite is ranked #9 in our comparison of over 100 popular multivitamin brands. The supplement requires you to take 6 tablets a day with a meal (preferably your breakfast or lunch). Quality manufacturing: The multivitamins are certified by NSF International. Antioxidants: includes key additional antioxidants such as Lycopene and Lutein which mop up free radicals and slow down the aging process. Wide distribution: Nutrilite's supplements are distributed by Amway network marketing affiliates in North America and 90 other countries. Synthetic ingredients: Contains some synthetic vitamins, such as Vitamin B6 (from pyridoxine hydrochloride), Vitamin C (from ascorbic acid), Folic Acid, and Vitamin B12 (from cyanocobalamin). High price: Due to its network marketing distribution model Double X comes at a premium price. The Double X multivitamin by Nutrilite is an excellent multivitamin. Consumers can rest assured that Double X provides effective supplements that bring tangible health benefits to people who use them. How does Nutrilite Double X compare with other multivitamin brands? MultivitaminGuide.org offers comparison between the Nutrilite Double X multivitamins and of all major vitamin supplements available on the market. Some of the unique aspects of this guide include comparison of the Nutrilite Double X multivitamins with 100 other vitamin supplement products, including popular brands such as One-A-Day, GNC, Equate, Kirkland, Shaklee, Nature Made, NOW Foods, Melaleuca, Puritan’s Pride, Herbalife, TwinLab, and Walgreens. The table below provides a summary of the Effectiveness Scores of some of the more popular vitamin supplement brands available on the market, including the Nutrilite Double X multivitamins.